We offer a wide variety of services to student organizations. Check out the options below to see if we can help accommodate your organization’s needs. Registered student organizations are eligible for photocopying services in the SORC. Note: Individual social fraternity and sorority chapters recognized by the Office of Fraternity and Sorority Life are not certified through the SORC and therefore, are not eligible for the SORC copy service. Greek governance organizations may not request copies on behalf of individual chapters as well. The name of the organization must appear on the first page of any document(s) being photocopied. Groups may request up to 200 grayscale copies per event (not 200 copies per day). One choice of color paper is permitted per copy request. Our copier has the ability to print back to back and staple up to 30 pages. Half pages and quarter pages can be produced from a full page original. For technical reasons, we are unable to make copies that have 75% or more ink coverage in the background. Organizations may not submit copy requests for other organizations. Copy requests will be completed in the order that they are received. We strive to provide same-day service but this is not always possible. Please plan ahead. Registered undergraduate student organizations are eligible for color printing services at the SORC. The name of the organization must appear on the first page of any document(s) being printed. Organizations can request up to 50 letter-sized prints per event (not per day). All prints are made on white paper for quality purposes. For technical reasons, we are unable to make copies that have 75% or more ink coverage in the background. This includes large pictures as well. Please note that organizations can only request either 200 grayscale copies OR 50 color copies per event. Registered student organizations are eligible to receive certain office supplies, free of charge. The amount indicated is per semester, unless otherwise noted. 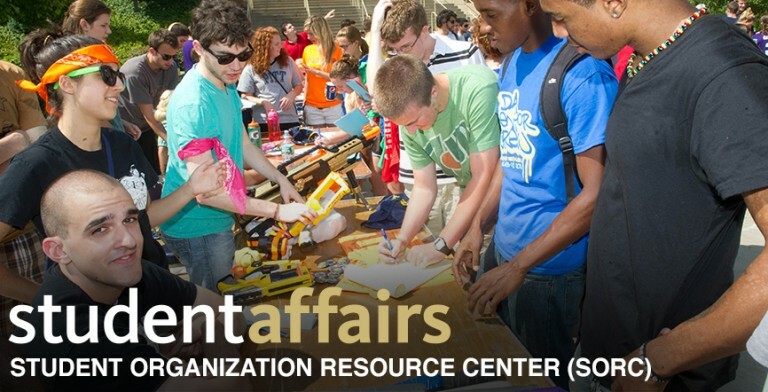 The SORC provides free mailing services to student organizations. All mailings must be organization business-related. The SORC requires that all mailings include correct mailing addresses and return addresses. Envelopes can be provided through the supplies requisition process, which can be filed directly in the SORC office. When requesting mailing service, the exact number of pieces must be provided. A fee is charged via University account number per order. All order forms must be submitted to sorc@pitt.edu at least 10 business days prior to event date. The Emergency Student Loan program administered through the SORC is intended to assist students in overcoming minor financial emergencies. Loan applications are available at the SORC office in 833 William Pitt Union. Valid Pitt ID is required to receive an application. *Any full scholarship student athletes must have prior authorization from Donna Sloan before applying for an Emergency Student Loan. Eligible applicants must be currently enrolled students carrying 6 or more credits during the term in which they are applying. Over the summer months, eligible applicants must be enrolled for 6 or more credits during any of the summer sessions or the fall semester. Eligible applicants should not have any financial holds on their University account. Students enrolled in their last term at the University of Pittsburgh must apply for this loan prior to the final tuition bill for that term is issued. Complete repayment of any previous Emergency Student Loan is necessary for new loans to be approved. The maximum amount any loan may be approved for is $300.00. Loans are repayable in monthly installments up to a MAXIMUM of 3 MONTHS coinciding with the PittPay billing cycle set forth by the Student Payment Center. Loans must be paid in full prior to graduation. Failure to repay your loan as agreed upon may result in the holding of your transcript or diploma and not being permitted to register for future terms. A two to three business day processing time is required.